John and Sue in Duet mode as the "Dynamic Duo"
John learnt to ring Church Bells in 1967 and rang at St Andrew's Parish Church Rochford, Essex where he continued to ring until 1990. He was Ringing Master there for 18 of those 23 years. John now sometimes rings for the Sunday morning service at St Mary's Church, Prittlewell. John is a lfe member member of the Essex Association of Change Ringers (a Registered Charity) and has been Auditor/Examiner of the Association's accounts since 1973. He retired from this post in 2008 after 35 years service. In 1972 John was introduced to musical handbell ringing by Philip Bedford of the Wigram Octavius Handbell Band. John has been involved with Handbell Ringing ever since. Sue began her handbell ringing days in 1986 after she met John at a Handbell practice of a team that John was running. 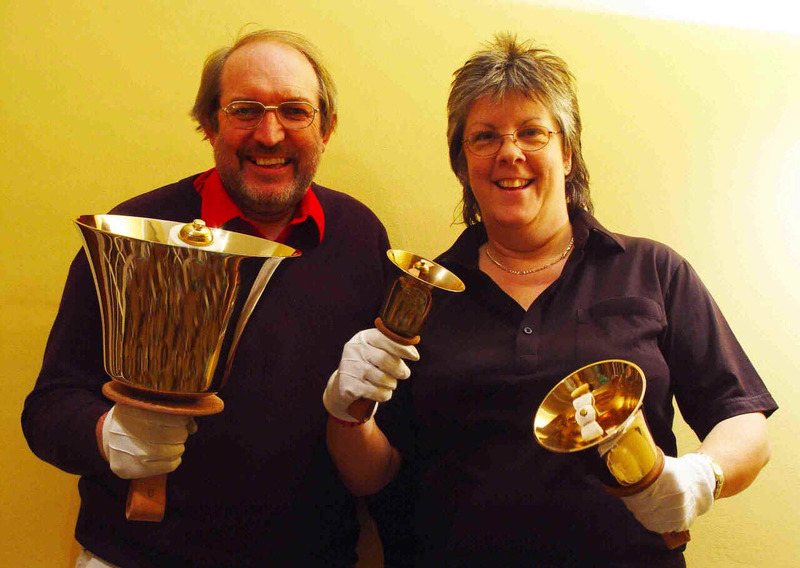 From May 2002 to December 2004 John and Sue played with Sound in Brass, an "off table" team situated near Chelmsford. 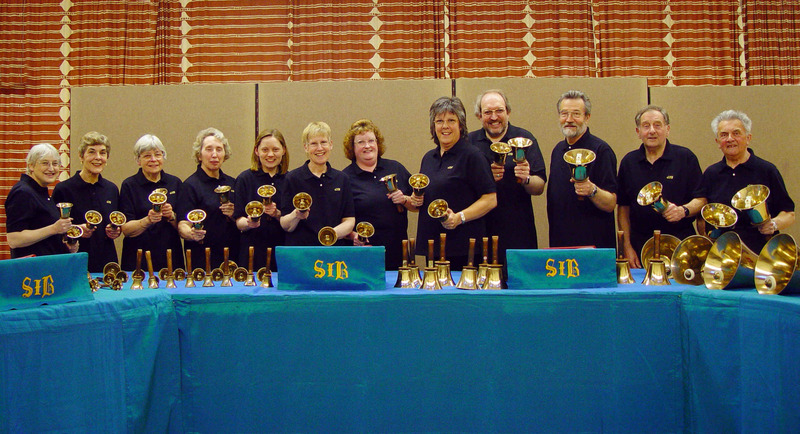 From September 2004 to April 2005 John and Sue have played in the Handbell Ringers of Great Britain South East Region Bell Orchestra which gave performances at the Royal Northern College of Music, Manchester and the theatre at Redhill, Surrey in April 2005. John is an honorary life member of the Handbell Ringers of Great Britain (HRGB) (a Registered Charity). On 25th September 2004 John was elected as National Treasurer to HRGB and became one of the 4 National Officers. Each year there is an HRGB national rally and concert in one of the 8 HRGB regions. On 1-3 April 2005 there was a special event instead of the national rally held at the Royal Northern College of Music Manchester, to celebrate the 150th anniversary of annual handbell ringing competitions starting at Belle Vue Gardens, Manchester. Sadly, the competitions died out in the 1920's after the first world war. Teams from all round the country with large sets of bells took part. HRGB was formed in 1967 when there was a revival in the art of handbell tune ringing in Great Britain. John had to resign as National Treasurer on 24th September 2011 due to ill health. John and Sue have played with the HRGB East Anglian Regional Team which gave a performance at the East Anglian AGM on 18th March 2006 at Horringer. John and Sue also played as a duo. In October 2006, Fred Gramann came back to England to lead HRGB's inaugural UK Bronze event at Sutton in Surrey where 60 ringers gave a concert comprising 9 pieces after 4 days of rehearsals. Fred returned for the second UK Bronze in October 2008 and has come every alternate year since. In July 2007 John and Sue attended the European Handbell Festival in Scotland. We stayed at Clydebank near Glasgow and also at Edinburgh and had the opportunity to play under the direction of Fred Gramann and Larry Smith at Dunblane and Dunfermline. John and Sue attended the European Handbell Festival in Prague and Vienna in July 2008 again under the direction of Fred Gramann and Larry Smith. In June 2017, John went to St Janskerk Church, Gouda in the Netherlands to see the first concert of the European Handbell Festival 2017 under the leadsership of Artistic Director and Conductor Debbie Rice. He was able to catch up with Debbie and see 2 old friends (Linnette and Betsy) who he had not seen since 2008. The above photograph of the Walford Family in 1889 was kindly sent to us by our friend Nick Hedges who found it in a local market in Bromsgrove.